Myth # 69: The first Thanksgiving took place in Plymouth in 1621. The heart-warming tale of Pilgrims and Indians sharing a Thanksgiving feast and prayers at Plymouth never took place. More accurately, it is a combination of two events that did take place: a harvest feast that occurred in 1621 with about 90 Wampanoag Indians and a day of thanksgiving declared by William Bradford in 1623. The pious Pilgrims did not consider that feast to be a “thanksgiving,” which to them meant solemn day of prayer at church, not a harvest celebration or a meal shared with heathens. Historians believe they would not have combined the two events as we do today. An annual Thanksgiving holiday wasn’t established until the Civil War, when President Abraham Lincoln made it official. All this begs the question of where the real first Thanksgiving took place. There are other serious contenders, you know, including Berkeley Plantation, Virginia, where the settlers were specifically instructed to make the day of their arrival in 1619 a day of thanksgiving to be celebrated every year thereafter. But St. Augustine, Florida, may trump them both with its 1565 date. This is where the Spaniards celebrated with a Catholic mass and a fine meal with the Timucua Indians. And Texas believes it has claims on an earlier event. Now, now, children, no squabbling . . . The truth is, there were many official days of prayerful thanksgiving in colonial America. Thanks for the info. I always like to find and realize real history. Mankind has such a propensity for misaligning the truth and making it totally self-serving. Recently I finished some books on the founding Fathers original religious views. That was very good. Keep Blogging. Keep Writing. P.S. I’ve been to St. Augustine, Florida and it’s beautiful. I’ve never had the pleasure of visiting St. Augustine but it’s definitely on my short list! I believe George Washington also proclaimed a day of Thanksgiving for Thurs, Nov. 26 in 1789 (see http://lcweb2.loc.gov/ammem/GW/gw004.html), more of day of prayer than a feast. My understanding is it didn’t quite catch on (and where it did was mainly in the North?) but set the stage for Lincoln’s national holiday, late in November (though, did I read that originally Lincoln’s holiday was the fourth Tuesday? and FDR moved it to third and later the fourthThursday?). Thanks! I like the idea of multiple events in different geographical locations involving shared harvest and thanks to God! So, last week I was in Kyrgyzstan . . . yes, I know that sounds weird, but I really was there, touring the Silk Road countries of Central Asia . . . and our young guide took us to see a statue of an important person. She told us that the placement of the horse’s hooves indicated whether the rider died in battle or in bed. I couldn’t believe that myth has traveled as far as Central Asia! To refresh your memory, here it is: Myth #44. This persistent myth claims that there is a code in the positioning of the horses legs in equestrian statues telling the fate of the rider. Supposedly, if one hoof is raised, the rider was wounded in battle. It two hooves are raised, he died in battle. If all four hooves are on the ground, he survived the battle/war. It isn’t true, but what makes it so amusing is that the myth persists, even though anyone can look around at the statues and see that there is no relationship to the “code.” Snopes has the best lengthy rebuttal at http://www.snopes.com/military/statue.asp, but I’ll summarize here. 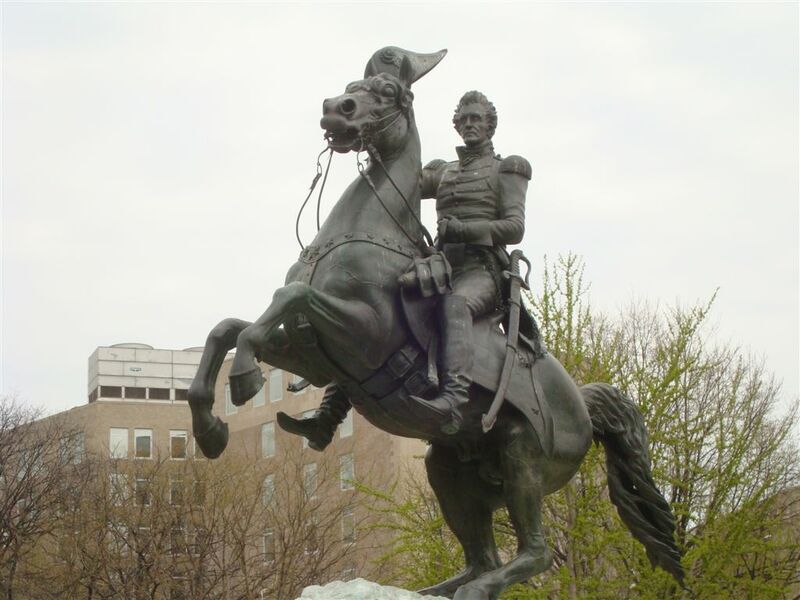 General Andrew Jackson, who did not die at the Battle of New Orleans but lived to become president. How did this myth get started? My opinion is that it started at Gettysburg where most of the statues actually do conform, if coincidentally, to the “code.” If you were to look at three or four statues and find the pattern held true, you might conclude all the rest did too. And we are all suckers for any sort of “secret code,” so that naturally sticks in our minds. 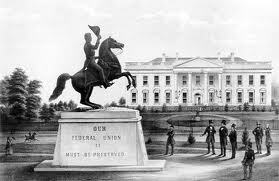 The equestrian statues code seems to be an American manifestation of the English effigies-of-knights code, which is at least as old as the nineteenth century. Supposedly, the position of the legs of the knights on their tombs indicates whether or not they went on Crusade. An English historian of the 1920s tried to debunk this by pointing out many examples where this was clearly wrong. We can all feel his pain as he wrote in 1923, “Surely it is time that the imaginary connection between cross-legged effigies and the Crusades should be exploded, and yet how rampant is that fiction in certain places, and how constantly it has to be contradicted!” No rest for the weary historian . . .
Revisited Myth # 130: People in the “olden days” were routinely buried with a string tied to their finger that ran above ground to a bell . . .
I’d been meaning to get to this one (“I’m not dead yet!”) for some time, but Susan Smyer’s forwarding of this article from George Mason University’s website, cited below, cinched it for now, as we approach Halloween. “One of the most characteristically Victorian fixations was the fear of premature burial. . . Accounts of this horrifying yet fascinating fear commonly describe the “escape coffins” reportedly sold in the nineteenth century to allow those mistakenly declared dead to save themselves at the last moment. The most popular of these, it is often said, was the cheap and simple “Bateson’s Belfry,” a bell mounted on top of a casket with a string running to the corpse’s hand within… so that, if the “deceased” suddenly awoke — before burial but in an extremely unwelcome predicament — he could instantly and easily summon help. The striking life-story of the inventor George Bateson is also often invoked. In 1852, he patents the belfry as the “Bateson Life Revival Device.” Rising rapidly to fame and fortune, he receives the OBE from Queen Victoria in 1859. But, obsessive fear of premature burial gnawing at his own mind, he designs ever more complex alarm systems for his own coffin, finally insisting his family have him cremated. In 1868 (transposed to 1886 in some accounts), he panics his instructions will be ignored, douses himself in linseed oil and incinerates himself. Positively dripping in Victoriana, satisfyingly redolent of Poe’s dark tales, the Bateson story has made many appearances, continuing to feature in popular books, historical web sites, and even the occasional news article. Earlier this year, it inspired a prize-winning graphic novelette. But did a bell device like this exist? If it did, it would not have worked, since the lack of air in a buried coffin would have killed any comatose person rather quickly. And while there are various patents filed that intended to “save” not-dead-yet people from premature burial with periscope-like devices that supposedly introduced air into the coffin, none has been documented as used. The term ‘dead ringer’ comes from horse racing, and the meaning of it doesn’t even apply to the mythical scenario. And ‘saved by the bell, is pretty obviously a boxing term. I did believe this one probably so cw fifth grade though, so thank you! that was great. you had me hooked! and then you said it never happened. funny. If this is a repost, please disregard. I have seen a few books who mention this story myself…they also mention medieval charnel houses that were places to leave the body at prior to burial until obvious ddecomposition had set in…with guards and a system of pulleys and bells with strings tied to the corpses finger to detect any sign of life. Since sometimes bodies do move during natural decompostion there may have been some rings and very frightened guards if these actually existed. I always wondered about the tale of the man mistaken for dead and left at the botton of a pile of corpses after the battle of Gettysburg…who was discovered later and found to be alive but insane…have you ever found any citations on that? Re: Gettysburg incident, no, I’ve never heard that. I’ve wondered about that one too. Most recently during a recent visit by relatives when pulled out the old Ghost’s of Gettysburg Battlefield auto tour. The tour was written by Mark Nesbitt an ex-NPS ranger at Gettysburg. He also made a couple of videos and the story might be one of the dramatizations. It was shown on the HIstory Channel several years ago. I’ll have to take another look at it and see what I can find out. Nobel had a lifelong fear of being buried alive, and in his will he left instructions to have his arteries cut after death, just to be sure. I thought “dead ringer” came from the practice by merchants, and others, of dropping a gold or silver coin on a hard surface to hear the sound it made. A coin of solid gold or silver will make a different sound than a counterfeit one of base metal mixed with gold or silver; the genuine gold coin making a different pitch ring and the counterfeit one making more of a thud. I have never tried it and it may be just another myth. A. LINDQUIST. These two designs seem to deal with the lack of air issue as well. The most recent alarm patented was late in the 20th century…around 1980 or so I think. Anyway, it still comes down to whether or not these devices were used. Probably not very widely if at all. Nonetheless, there was a very real fear of being buried alive dating back to the 18th century in the U.S. I think it is Elizabeth Drinker’s diary that records some details about a family member observing the body of the recently departed to identify signs of death (I think she calls it putrefaction) before allowing the body to be buried. Other diaries record family members worrying about burying someone too soon ( in the case of the 1793 yellow fever epidemic in Philly). Pretty interesting. What does a study by three psychologists mentioned in the Feb. 12, 2011 Economist have to do with history myths? Quite a lot, as it turns out. Derek Rucker and David Dubois of the Kellogg School of Management and Zakary Tormala of Stanford business school were studying the psychology of information qualifiers and how rumors are spread. Experimenting with undergraduates, they found that, as information is passed around, the qualifiers are lost. For instance, the first person says, “I am not sure if this is true, but I’ve heard that . . . ” The second person repeats it as, “I heard that . . . ” Soon it becomes, “Did you know that . . . ?” Even when no one intends to spread false stories, they spread because the qualifiers fail to travel along with the rumor. The focus of their research was on whether companies should rebut false information, but I thought it was worth pointing out for its application to the spread of historical myths, or “myth-information,” as someone called it. The article is quite short. Read it at http://www.economist.com/node/18114835. Or below (some readers reported that they couldn’t access that link). Such rebuttals are unwise, argue Derek Rucker and David Dubois, of the Kellogg School of Management, and Zakary Tormala, of Stanford business school, three psychologists. By restating the rumours, Coke helps to propagate them. Its web page is a magnet for search engines. And people who read rebuttals tend to forget the denial and remember only the rumour, says Mr Rucker. As information is passed around, important qualifiers are lost. A rumour may start as “I’m not sure if this is true, but I heard that…” Then it evolves into: “I heard that…” Finally it becomes: “Did you know that…?” Even when no one intends to spread falsehoods, they spread. In several experiments, Mr Rucker and Mr Dubois planted rumours among undergraduates. They found that with each repetition, scepticism diminished. The rumours themselves did not change; only the likelihood that the students would believe them. These findings were published in a report called “The Failure to Transmit Certainty”. Revisited Myth # 145: It was the custom to bury old shoes in a new building for good luck. Susan Smyer wondered about the custom of burying a shoe in the walls or foundation of a house. For good luck? To ward off evil spirits? Is this a myth? I acknowledge Mr. Carlson’s warning against over-generalizing, but my own view is that most instances of shoes in walls were prompted by superstition. Why is the illustration a holster? It’s an upside-down shoe found inside a wall in England. Well Thomas,I was sure . . . until I saw your link. I got the picture off the Internet where it was mislabeled. My bad. I’ll take that down ASAP and put up another, hopefully more accurate! As a young man before the Cuban revolution, Fidel Castro tried out for the New York Yankees, almost making the team. I believed this! Until I read the debunking on NPR, I thought this was true. Something in the same vein as Hitler having been rejected from art school. An “if only” sort of feeling washes over you as you contemplate the way the world would have gone had Hitler been accepted to art school or if Castro had made the baseball team. But it’s not true. Adrian Burgos Jr., University of Illinois history professor and author of Playing America’s Game: Baseball, Latinos and the Color Line, says it simply didn’t happen. One way he knows that is because the Yankees didn’t scout in Latin America until the 1960s and the Cuban Revolution began in 1953 and ended in early 1959. Read the entire story here on the NPR site.